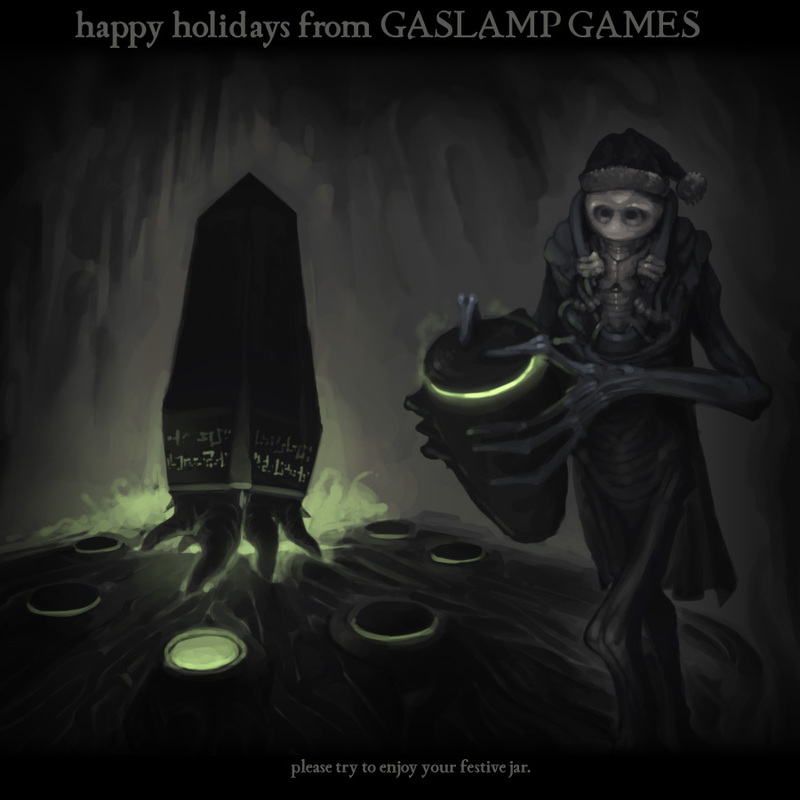 Happy Maddening Doom-Laden Holidays from Gaslamp Games! Last year, at about this time, I was on a bus somewhere on Vancouver Island, when Daniel called my cellphone. “You know,” he said, “everybody who downloaded the new expansion pack has suddenly found their game overrun with Giant Pink Scorpion Diggles and it’s totally unplayable.” I ended up fixing that bug, and putting up a hotfix, from a Starbucks in Ladysmith. At some point, somebody from the IRC channel – I never found out who – ended up tracking down which Starbucks I was working from, and arranging for somebody to buy me coffee and scones, to the bemusement of a very puzzled barista who had never seen this sort of thing happening before. That was the year that Christmas was cancelled, but it was kind of okay, really, because when neat stuff like that was still going on: when perfect strangers from the Internet were being very understanding about things screwing up and were stalking you to find where you were and buy you pastries – well, what more do you need in your life? You remember moments like this as a game developer. And you also resolve to never schedule your holidays in the middle of release schedules ever again. We have a modding community for Dredmor now, which continues to produce nifty things to this day. We also now sell stuffed Diggles, apparently. (Have you bought yours yet?) We have given talks at major conferences about what we are doing – Daniel at Penny Arcade Expo, myself at Casual Connect – because apparently people like what we do and want to learn about it. We have exhibited at a trade show for the first time ever, and have been on the cover of PC Gamer with a six page article about us and our work in it. In short, it’s been an absolutely ridiculous year. We couldn’t have done it without you, our valued customers and loyal audience, who seem to gleefully put up with all our wacky shenanigans. As always, we thank you for your support, and we are glad to have you along as a part of it. But now, we must rest. The Ur-sleep has come upon us. We are taking a break at the offices – shutting down the fleshy pods, tucking them into their nurting jackets of bubbling ooze, and letting the massive flywheel in the generator slowly come to a grinding halt. Soon, the offices will fill with the cryogenic suspension foam and… er, yes. That. Please enjoy your doom-laden holidays, and remember to bathe in the light of the maddening solstice rays in a responsible fashion over the holiday season. 2013 is going to be amazing. 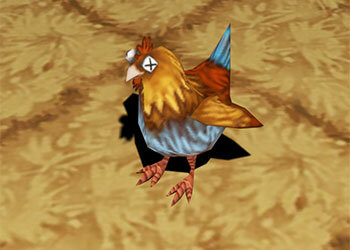 Weekly updates on Clockwork Empires will resume in January. Diggles are shipping! 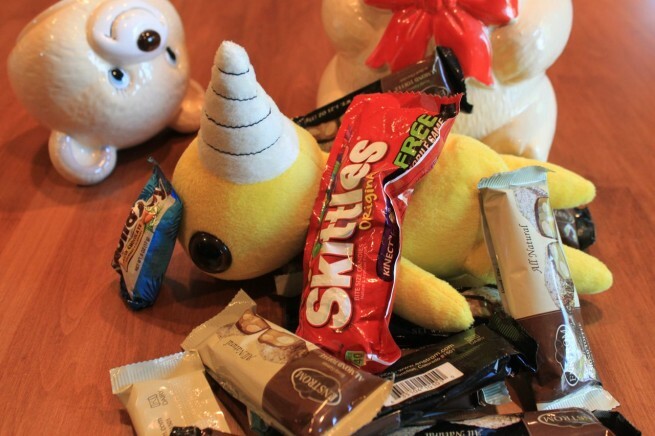 People have already started receiving shipping notices saying that a “yellow bird with a white beak in a plastic bag” (plus sketches) are headed their way. International shipping should now also be available to just about everywhere, and anybody who has problems with international shipping should e-mail ShouldBee, our partners in Diggle Crime, at international@shouldbee.com for assistance. ShouldBee has asked us to note that they have been adding one sketch per *order* – so if you ordered twelve Diggles, you will get twelve Diggles and one sketch. This is because there are a limited number of sketches and we want everybody to enjoy David’s fine doodlings (or, alternately, my programmer art.) If your Diggle arrives, why not let us know? Put up a photo on the forums or in the comments and let the world see your new fuzzy yellow companion. Happy Halloween, everybody! And don’t forget the Canadian Indie Bundle is STILL ON SALE. You’ve all read Boatmurdered, right? A “Let’s Play” (or LP) is a narrative write-up of a game playing experience, preferably entertaining. Fans of Dwarf Fortress do this a lot – they’ll either play a game themselves and write up the events that occur into story form, or they’ll pass it between forums members with each writing a chapter for their part of the game. This is not a recent phenomenon or one limited to the DF community. Or the Something Awful community, for that matter. Over in Paradox land, players of their historical strategy games have written up “After Action Reports”, aka AARs, in a tradition that goes back to tabletop wargaming. These probably started out as purely functional reports of the course of a game, but over time they’ve grown into elaborate alternate histories with characters and drama that don’t exist in the mechanics of the game ending up somewhere between a walk-through and fan fiction. These stories give a look into gamers’ experience of the games they play – it’s not just what happens on screen; there’s all kinds of imagination at work especially in games that leave room for speculation, implication, and creativity. So sandbox games, building games, simulations, and even especially open-ended RPGs are perfect environment for this sort of thing. (I’ve even seen some Quake fanfic that … wasn’t terrible.) Well, it’s only natural for people to write down the stories they make & experience. 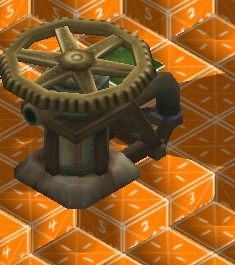 With Clockwork Empires we want to make a game that gives players just that kind of creative space and experience. And of course as game-players and creative people ourselves, these stories are just the sort of thing we love to enjoy & create. So: could not the principle be applied in reverse? Sure, any game designer does this to some degree eg. “I want to make a game where you’re a hero and go on adventures and find a magic sword and fight monsters!” can be turned into a game simply enough; from story/theme to mechanics. Dwarf Fortress does this quite explicitly as a conscious practice; Zach Adams writes short stories that take place in a fantasy world then he and Tarn sit down and work out what game mechanics might support that story taking place. We’ve done this too, in a few forms. On at least one occasion we sat down with a grid-mat and some dry erase pens and played out what amounted to a free-form tabletop roleplaying game of Clockwork Empires: It started with an expedition meaning to build a bridge, some wood getting chopped down, then spiraled directly out of control as a Mysterious Statue was discovered, found to spread Madness, dumped in a lake to contain it, then water from the lake used to create ale, then everyone was driven Quite Mad. To our astonishment Dungeons of Dredmor is a year old today; we released the game on Friday, July 13th, 2011, and immediately followed it with about three patches. To say that the past year has been a bit of a roller-coaster is, perhaps, rather understating things. Wondering when you can begin exploring the forgotten dimensions of lost wizards? 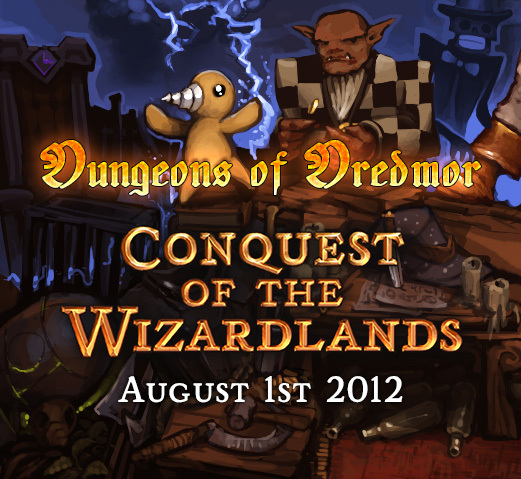 Then gather ’round, because Gaslamp Games is pleased to announce that the Conquest of the Wizardlands expansion for Dungeons of Dredmor will be launched on August 1st. Let’s do that one more time with art. Lightning! Brax! The Bomb! Wizardly Empties! Diggles again! Conquest of the Wizardlands has it all! Now let us hint ominously at Things To Come. Turns out when you’re writing a renderer for a game, and the renderer isn’t finished, it’s hard to come up with really awesome stuff to show people about the game you’re making. This is essentially what we’re waiting on before we blow the lid off of everything on Project Odin. We want to be in a position where we can show you what we’re working on, get your feedback, ask you about things you’d like to see in the game, and answer any questions you might have. We are also taking some time to actually get organized. The game is going to take more than a year to get done (not six like the last one! maybe two though) and one of the biggest issues with making a thing that takes as long as games do is that it’s difficult to keep all the important stuff in your head when you haven’t thought about it in a while. We were guilty of a lot of this on our first (failed) project, and we were guilty of more of it on Dredmor. I’m sure it will happen for Odin as well, but my job over the last two weeks has been getting us set up with a way of managing our project stuff so that we can be as organized as possible with as little effort as possible. (For those of you who are interested, we’re using Atlassian, and it seems pretty awesome so far.) I’m also starting to understand why so many indies make all their games, start to finish, in a month. 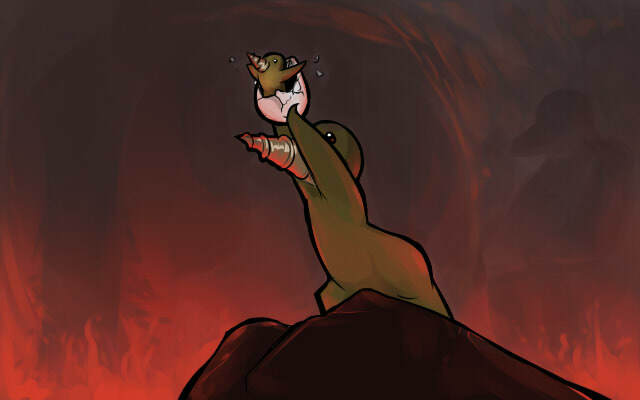 Coming soon: some Dredmor news pertaining to toys, the Steam Workshop, and some new content! 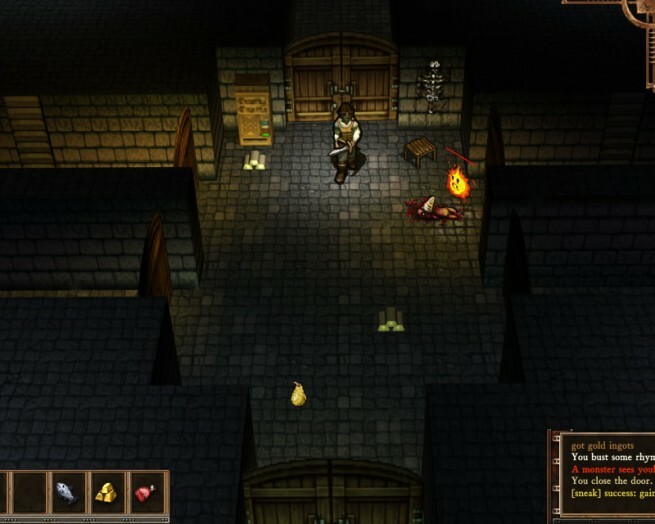 The stars are right, and you know what that means: It is the privilege and pleasure of Gaslamp Games to announce Dungeons of Dredmor II 3D, a sequel to the rather strange 2011 Indie Roguelike hit Dungeons of Dredmor (called Indie Game of the Year by the madmen of PC Gamer Magazine). Suddenly, a pre-alpha screenshot appears! Click to view full size. A first look at the dungeon. Using lots of placeholder assets for now, so please pardon the mess. Like any respectable developer, Gaslamp Games acknowledges that once you’ve got something good, the only rational course of action is to beat yearly sequels out of the IP. Given that we could afford to hire some more artists and rustle up some Maya licenses, the obvious move was to take Dungeons of Dredmor in an entire new direction where we can explore additional, ahem, depths of gameplay yet unseen. Entirely 3D dungeons built with procedural generation to create unique levels, traps, and puzzles sadistic enough to confound every John Urist! 600 bazillion damage types! Damage enemies with x-rays, phlegmatic damage, poking, subtraction, melancholia, insinuation, gluten magic, freemasonry, and liver! New, avant-garde soundtrack by experimental Japanese noise group Violent Onsen Geisha! Powered by the shocking return of a 2012 version of Ken Silverman’s Build Engine, used in such hit games as Redneck Rampage, Duke Nukem 3D, and Shadow Warrior! Eleventy quintillion cheeses, each with their own damage type! Includes your favourites (Churpi, Khoa, Paneer, Brimsen, Remoudoi, Sirene, Anari, Molbo, Danbo, Tybo, Handkäse, Weisslacker, Kaseri, Höfðingi, Skyr) and more! Use our in-app store to purchase Digglebucks to upgrade equipment, buy new inventory slots, and reverse negative Krongings! Play our awesome tie-in social and mobile games to increase “quest resources” to get the best ending! Get 12 "likes" on this post and we'll give you a lutefisk for free. Dredmor 2 will use that one really annoying, unreadable font from Dredmor for everything, and not just the title text! Even smaller, more numerous and indecipherable stat icons! 3D-accelerated coloured lighting effects the likes of which haven’t been seen since the far side of 1998! You still can’t see what your character is wearing – because, well… the hell with it! Explore new challenging gameplay mechanics set in the Red Light District of Amsterdam! Collect a series of tiny, magical hats by mastering The Third Dimension! New, revolutionary, Artificial Stupidity technology makes previously smart monsters into gibbering morons! 98% More Indie than Other Competing Indie Roguelikes! Scads of Day-1 DLC include the ability to load and save games, and to have the ability to secretly save extra copies of your games in case you die suddenly with permadeath on! New Crafting Systems include Yogurt Making, Elven Drycleaning, Bavarian Crafts, and the Human Centipede! Cameo appearance by Famous British Person Peter Molyneux as Brax the Salesdemon! Get ****ed up on Mushrooms! Dredmor 2 will be launching on all fine Social Gaming Platforms near you. Have your credit cards ready. Congratulations to Gaslamp Programmer-Affiliate Ryan C. Gordon (better known as “icculus”, the great and knowledgeable), who is now the proud father of a lovely daughter. (This has slightly delayed our incoming patch yet more; just before dashing to the hospital, Ryan immediately said “Here! Have an entirely new SDL library and audio driver!” This fixes a lot of the stuttering issues, as well as various performance issues and crashes under OS X, but I’m currently quietly poking his changelist with a stick, somewhat afraid that it will bite me.) We have celebrated by having Chris Triolo produce this small homage to the Lion King. We are pleased to announce that Sean Hamilton has joined the Gaslamp Games team. Sean will be working with us on Project Odin; since his arrival on the project, he has already produced three crates, a selection of small shanty houses, two logs, one ingot, and a mineshaft. Auspicious. We are still looking for a character modeler and a gameplay programmer to do some contract work on Dredmor with us. I think we’ve got everything else taken care of at this point. Exciting. If you think you’d be a good fit for either of these things, please drop us a line at jobs@gaslampgames.com ; I think, at this point, that we are restricting ourselves to locals after all for the most part. There is vague talk of doing another Dredmor DLC pack, either as an additional paid expansion (of a form to be determined) or a free DLC package of some sort to be determined. Other than our continued commitment to patching and general subterfuge, is there anything else specific that you’d like to see from us? Let us know in the comments. Finally, here’s another Odin teaser.